Jimmy Walker’s your winner, beating the field by nine strokes (!) with a dominant Sunday performance. His performance relative to the field was the best since Martin Kaymer stomped everyone at Pinehurst last June and his winning margin was the largest on Tour in six years. Adam Sarson has a great recap here. Walker’s win was comprehensive – he led the tournament in putting and was 2nd in long game (tee shots+approach shots) play (to K.J. Choi no less). In fact, if he had just putted at an average level this tournament, he would’ve tied English, Woodland, and Kuchar for 2nd place. Coming into the week, I talked about how the Sony doesn’t seem to punish guys who are wayward off the tee. Walker is the team captain of the wild-off-the-tee guys. Of course, you have to be able to bring it with the irons (Walker certainly can) and putt well (yup), but wildness is not penalized here. What’s interesting about Walker’s performance is that he’s putted extremely well in the Hawaii events since returning to the PGA Tour full-time in 2008. Between 2008 and 2013, Walker putted about 0.3 strokes better per round in the Sony Open. In the four Hawaiian events since (two wins and a 2nd), he’s putted 0.8 strokes better per round. For the whole period (36 rounds), he’s exceeded his normal putting performance by over half a stroke. Perhaps that’s random noise or perhaps there’s some level of comfort with the bermuda grass greens at Kapalua and Waialae, but anytime you can start a tournament with a half a stroke edge each round, you’re a lot more likely to win. This is his fourth win since the start of 2013 (tied with Patrick Reed for top on Tour). It propels him to 1st place in the FedEx Cup standings – a familiar position that he held from this point until Rory’s dominant run last summer. Walker’s also pretty much assured his place on the Presidents Cup team this fall. He’ll look to defend at Pebble Beach in a few weeks. Before the tournament I was very interested to see how Luke Donald played this week – especially with his irons/wedges/short game. His struggles last season were all about how poorly he was playing inside 150 yards and the hope was that his return to Pat Goss was going to help him on that front. In his first start, the signs were promising. He finished T51, driven by a typically great putting performance. Donald will always be able to keep his head above the water with his best in the world putting. The rest of his game definitely showed up too. He’s never hit driver well and didn’t this week. However, he was solidly above-average with his approach shots – despite this course offering few chances for the very short <125 yard shots he used to excel the most at. Despite hitting only 43% of fairways and losing nine yards to the field off the tee, Donald hit 71% of greens and was above-average on wedge shots, short and mid iron shots, and long iron shots for the week. So far so good. Matt Kuchar’s performance was up to expectations this week. The long game looked fine and he putted out of his mind – especially on par putts. My numbers had his short game performance as average, but he managed to scramble successfully 83% of the time. That means he was money on short par putts all weekend. He has to be disappointed to have played so poorly on the weekend, but his game looks fine going into the California swing. It was nice to see rookie Justin Thomas break-through with a top ten. He got a lot of attention from the broadcast crew for his absurd length off the tee (he easily hits driver 25+ yards past Tour average), but it looks like he was laying up off the tee with irons/hybrids often. That’s not that rare for the longest guys, and I wouldn’t be shocked to see him do it a lot this year as he’s feeling his way around the PGA Tour courses. Waialae CC‘s a par 70 track tucked away in Honolulu. The fairways are pretty narrow (~50% fairways hit in recent tournaments), approach shots are shorter than average, and overall the course plays below par. Nothing else really stands out except that both par 5s are reachable in two by anyone in the field. Looking at some stats, it’s normally been the case that guys who are less accurate off the tee have been fine here (Charles Howell III normally kills here, Jimmy Walker won last year, etc.). For what it’s worth, my numbers say guys who play better from the fairway than the rough have been more successful here – which makes no sense intuitively because half your approach shots are coming from the rough. If true, Chad Campbell, Zach Johnson, Chris Kirk, etc. are the guys who are better from the fairway than the rough, typically. Luke Donald’s easily the most interesting guy in the field this week. Last season was a pretty large step down from his recent play – mostly manifested in how he hit his short irons and wedges. He moved on from longtime coach Pat Goss in 2013 saying he was looking to focus more on his ball-striking. His longer irons improved from 2012-13, but inside of <150 yards he completely fell off a cliff. He was one of the absolute best in the world with a short iron or wedge in his hand prior to this year, but posted numbers that were at or below Tour average in 2014. He decided to go back to Goss this fall; Goss said they immediately began focusing on “his strengths; putter, short game, bunker, wedges, shots inside 150 yards” (last year was also Donald’s worst season around the green in at least the last five years). Putting and short game play is more variable, but I’ll definitely be looking closely at how he’s hitting his irons/wedges this week. I don’t think Donald’s ever going to get back to his 2011 peak where he was the best in the world, but if he can play well inside 150 yards, rediscover the short game touch, and continue to be among the world’s best putters, he can return to being one of the best 20 or so in the game. That combination probably will not win him a major (recent major winners have been heavily biased towards guys who are better with long irons), but he’ll contend often. I think some folks have forgotten he came within a Matt Kuchar hole-out of winning at Harbour Town just eight months ago and had three other top tens by May. I’ll also be keeping an eye on Matt Kuchar going forward. Ever since he injured his back prior to the PGA Championship he’s been getting more or less similar results, but driven by different parts of his game. Prior to the injury he let his long game (approach shots+tee shots) carry him, but afterwards its been all about the short game and the long game has fallen off. He said he was healthy as soon as the Barclays, but it’s something to keep an eye on if he keeps struggling with those longer shots. Rookies Tony Finau and Justin Thomas both rate out as above-average Tour players already based off their results in 2014. Finau had easily the most impressive debut of any rookie in the fall portion, earning two top 10s and two more top 20s in five starts. Come for the ridiculous power he can generate with the driver (#4 in club head speed in 2015), but stay for his approach shots (almost a full stroke better than the field so far). If he can retain any of that performance going forward he’ll contend for a win and Rookie of the Year honors. Thomas’s debut was sloppier, but he scored a top 5 in Mississippi after a trio of bad outings to start the year. This also marks the earliest we’ve ever seen Francesco Molinari appear in the US for a full field event. He’s mostly spent his time in Europe, appearing only a handful of times in the US for normal PGA Tour tournaments. He’s long had the talent to hang around at the top of leaderboards so he could make a significant splash if he starts playing a lot of US events this year. Molinari’s one of the most accurate guys in the world off the tee. These are the guys who have played best here relative to their typical performances. In other words, for each year they’ve played I’m comparing their Sony performance to their average performance for the year (minimum 3 starts here since 2008). I don’t put a lot of stock in these because they’re a bit polluted by putting luck and only represent a handful of rounds. Patrick Reed’s your winner – his 4th win before age 25 – thanks to splashing an 80 yard wedge on 16 and making back to back birdies on 18 to close out his round and beat Jimmy Walker in the playoff. Great recap from Adam Sarson here. This win makes Reed the fourth golfer to win four times on Tour before their 25th birthday – Tiger, Rory, and Sergio are the fairly obvious others. Looking forward, Jordan Spieth has 3.5 years to capture three more official wins and I don’t think anyone would be surprised if Hideki Matsuyama reached that total either. Regardless, it’s a pretty impressive accomplishment. Reed’s career to this point has been pretty amazing to watch. He spent 2012 Monday qualifying (6 times!) and playing on sponsor’s exemptions before winning his Tour card in the last Q-School. He then faced down fellow rookie Jordan Spieth to win his first title at the Wyndham in 2013 and came out last year and won twice in the first three months – including over a stacked field at Doral. The funny thing is he hasn’t played that well outside of those wins; he has four career titles and only six other top tens. In fact, the PGA Tour has him ranked 69th and 52nd in scoring average the past two seasons. He just hasn’t brought it consistently every week. That disconnect between his results in the large majority of events versus his wins make him one of the most interesting guys this upcoming season. Below is a graph of his results since the start of 2013 subdivided into one of seven bins based on his performance relative to the field. Anything on the left side of the graph is usually a missed cut or a very low finish, anything to the right is top ten territory or a potential win. I’ve compared Reed to golfers similar to his performance suggested by his scoring average and to golfers who have elite performance. You can see Reed’s best performances compare favorably to the elite guys (Keegan, Webb, Dufner, etc. ), but quickly drop below even guys with comparable overall performances. He just has more of the awful weeks than he should based on his performance. That’s the challenge for him this year; everyone knows he can win on a great week, but part of being an elite golfer is grinding out those top 10s and top 25s. Reed’s definitely worthy of more research and discussion. Day’s flashed his ridiculous upside with seven top tens in seventeen major starts and consistent high level play since he was 21. He’s sort of the opposite of Patrick Reed in that he’s reeled off a bunch of great finishes in Tour events, but only captured two wins. He’s also has a weird combination of skills in that he hits it really well off the tee, putts at a consistently high level, and has a good short game, but hasn’t shown much ability to hit his irons well. Last year was his best year with his irons though, despite back, thumb, and hip injuries. Through the first tournament, things are looking good for him. In a week where the putter and short game weren’t that impressive, Day still finished on top of the long game rankings (Tee shots + approach shots). He showed huge distance off the tee (2nd to Bubba) and hit the 2nd most greens. Day’s already a top ten guy in the world based on his performance; any improvement with the irons would propel him near Rory territory. Kapalua is one of the most unique courses the Tour visits each year. The extreme landscape, including over 500 feet of elevation change, and resort set-up produce some pretty ridiculous stats. Players at Kapalua almost always produce the highest GIR and driving accuracy for the season, while the extremely slow and undulating greens are the 2nd hardest to putt on on Tour behind Pebble Beach. Kapalua is also the only course on Tour with more par 5s (4) than par 3s (3). These characteristics do combine to favor certain types of golfers. Most golfers hit around 14-15 greens per round here versus only about 11 at the typical Tour course. Golfers who struggle to get it close from around the green find that part of their game less exposed at Kapalua. This week, Russell Henley and Angel Cabrera are among the guys most likely to benefit from avoiding scrambling shots. On the flip-side, Jason Day has a great short game that he’ll need less often this week. The pros regularly hit over 80% of Kapalua’s comically wide fairways, meaning they’re hitting from the fairway about 12 times a round, versus 8-9 at a typical Tour stop. Certain golfers struggle from the rough, while excelling from the fairway (relative to Tour average). Those guys won’t have to contend with the rough on most holes. Ryan Moore and Camilo Villegas stand out as guys who are much more successful from the fairway than from the rough. On the flip-side Hunter Mahan derives a large advantage over the field from how well he plays out of the rough. That will be negated a bit this week. Kapalua is always thought of as a bomber’s paradise, but the dirty secret is that it actually plays very short despite its 7400+ yard layout. Fully eight of the ten par 4s can set-up as wedge holes, leaving only five medium or long iron shots on par 3s or 4s. Hideki Matsuyama dominated with wedges or short irons last season and he’ll be able to feast in his first visit to Kapalua. Tim Clark is another great wedge player. I’ve been playing around with a projection model based on comparing golfers to past golfers to attempt to predict performance for the upcoming season. These types of models are common; most notably, Baseball Prospectus has PECOTA for MLB and Kevin Pelton has SCHOENE for the NBA. They work by certain identifying characteristics (stats, physical measurements, age, etc.) and then generating a list of comparable players who are most similar to each player being projected. From those comparable players you can generate statistical projections, confidence intervals, breakout/decline probabilities, etc. The hope is that by comparing players to thousands of past player seasons you can identify characteristics of players who improve or decline that aren’t immediately obvious if you just have point estimates of their talent level. For my model, I selected six inputs (N=season prior to the one being projected): performance in seasons N, N-1, and N-2, change in performance between seasons N-2 and N-1 and between N-1 and N, and age in the middle of season N+1. For this year’s projections that means I’m using performance in 2012, 2013, and 2014, change in performance between 2012 to 2013 and 2013 to 2014, and age as of 7/1/2015. Based of these inputs I’ve generated a list of the 100 most comparable golfers from 1992-2013 (or fewer if that golfer had fewer comparables that met my threshold). All projections are based on the subsequent performance of those comparable golfers. I’ve generated probabilities for each golfer to breakout (improve by 0.5 strokes/round), collapse (decline by 0.5 strokes/round), improve (any improvement), and decline (any decline). I’ve also generated a mean projection and 95% confidence interval for each golfer’s performance this season. Each golfer’s five most comparable seasons is listed, as well as the number of comparable golfers that met my threshold (no one reaches 100 because of the presence of a handful of 2014 seasons; these are ignored). I’ve attached the results in the Google Doc at the end. Back-testing using the projections for last season this model predicted that 18% of golfers would breakout and 22% would collapse. In reality, 16% broke-out and 24% collapsed. 94% of projected golfers fell within their 95% confidence intervals. The correlation between projected and actual mean performance was 0.75, which is slightly stronger than past attempts to project simply using prior performance. The mean absolute error was 0.5 strokes, meaning the average projection missed by 0.5 strokes in either direction. My use of breakout is to say a golfer will play significantly better (0.5 strokes) than they did the year before. Examples are G-Mac, Jason Kokrak, and Ryan Palmer last year. Simpson, Schwartzel, and Snedeker all had down years last year, but the model sees outstanding prior performance and ideal age and predicts a comeback. Matsuyama’s 2014 compared very favorably to a lot of outstanding seasons by young players including McIlroy, Sergio, Jason Day, and Justin Leonard. Ishikawa gets credit for consistently average play at a young age. I define a collapse when a golfer declines in performance by 0.5 strokes. Examples are Tiger Woods, Jason Dufner, and Nicolas Colsaerts last year. McIlroy’s place here will likely look stupid in 12 months, but his projection is generated from a very short list of comparables. Almost no one has had the up-and-down last three seasons that he has had while also playing at an absurdly high level. The model is most unsure about his projection of any of the 200+ guys projected. The model hates older golfers – it gives Angel only a 28% chance of playing better than he did last year – and John Senden, Thongchai Jaidee, and Robert Karlsson all appear near the top. The PGA Tour returns to Sea Island for the fifth McGladrey Classic this week. The par 70 Seaside Course winds through tidal flats, marshes, and dunes to create a fairly unique course among the venues visited by the PGA Tour. Most fairways are exposed to the wind, like on many coastal courses, but hazards also threaten on about half the tee shots – often left and right. This places a premium on controlling ball-flight and hitting fairways. Players hit fewer drivers here than on almost any other course the Tour plays just for that reason. The course is relatively short, even for a par 70, and doesn’t require many long carries with an iron. The field isn’t particularly strong – though no worse than the past two weeks – and has some star power at the top with three Ryder Cuppers, Chris Kirk, and Bill Haas. The attention this week will be on the rookies – particularly the long hitting Tony Finau, who is working off a T12 and T7 to start the season. Seaside is a course that harshly punishes bad misses off the tee; learning where you can miss while still playing a proactive, birdie-seeking game is important for the rookies. Interestingly, the rough is very benign compared to normal. A player who misses fairways, but doesn’t find the hazards will do fine this week. Recognizing that the course history here is only four years and ~500 players, I looked into what types of players succeed here. I controlled for putting performance, meaning I’m looking at performance relative to the field ignoring any shots on the green. I’m interested in how a player’s tee to green style affects their performance at Seaside. I also controlled for player ability as represented by my z-score ratings; unsurprisingly these proved to be the most important piece of the predictive puzzle. However, I also looked at measured driving distance (ie, how far can you hit tee-shots), driving accuracy, and greens in regulation. The results showed that players who hit more fairways on average (and this can be a result of cautious play off the tee and/or greater accuracy off the tee) perform better than normal at Seaside. Each extra fairway hit above PGA Tour average is worth about 0.4 strokes better performance than at an average PGA Tour event. In comparison, ability to hit for distance off the tee showed no correlation with success here. That’s likely because of how few drivers are hit off the tee here; the long hitters have few opportunities to shine here. Hitting greens isn’t much of a separator either because they’re large and easy to hit. The ideal player here is one who builds their success off their mid-irons – Webb Simpson and Chad Campbell come to mind. Most players can get around this course by staying out of trouble off the tee and hitting the greens. To actually win you can’t be suckered into that survival game because there are birdies available for good iron players. Overall, I estimate players hit driver on only 59% of their par 4/5 tee-shots last season – substantially fewer than the around 70% Tour average. Lay-ups are most common on #1, #2, #4, #8, #10, #13, and #14; players hit driver less than half the time on those holes last year. I don’t have enough data to map out trends in successful strategies. At #1, the fairway is very wide up until around 265 yards off the tee, before it tapers quickly and two bunkers lurk to the right. Playing a lay-up results in a 160+ yard second shot, but allows for a straight-forward shot from the fairway. At #2, there’s water/marsh in play on both left and right misses and the tee-shot is completely exposed to a left-right wind. The play here for most was the lay-up into the 250-280 yard range where the fairway is inviting and the worst miss is left into a fairway bunker. #4 is the signature hole on the course for me. It’s an extreme dog leg left with the marsh in play off the left side and a bunker long to capture anyone playing aggressively down the right side. Most laid-up to the fat part of the fairway leaving ~170 to the pin. #8 only offers trouble long. The green falls just short of drivable from the back tees. A shot of < 260 yards onto the extremely wide fairway is safe; anything beyond must avoid a waste area left, two bunkers guarding either side at 260-280 yards, and a bunker in front of the greens, as well as hit a fairway that’s as narrow as 16 yards. Any miss right aiming towards the green is swallowed by the trees short left. #10 has water left off the tee and a large bunker right. The safe zone for longer hitters hitting driver is less than 45 yards between the water and bunker, making driver off the tee an extremely dangerous shot. Anything short of 280 yards is likely fine absent an extremely wide miss to the left. #13 has bunkers long and right and a marshy channel right. In the limited sample of data I have driver was the better option for longer hitters; there’s not a ton of risk with the water far to the left. #14 is the last lay-up hole before almost everyone takes out driver down the stretch. This hole offers a completely exposed tee-shot next to the water, aiming at a tiny safe landing area between trees right and marsh/native area left. The cautious play is anything between 260 and 280 – avoiding the bunker/tree right. That does leave almost 190 yards for the second shot. Choosing which club to hit on par 4/5 tee-shots is one of the major strategic decisions a pro faces on a hole. Hitting driver is regularly worth an extra 30 yards of distance, but shots hit with driver are on average hit further off-target than shorter clubs. This introduces larger risk of hitting into the rough, fairway bunkers, or OOB, and the larger carry of the driver takes moderate misses and compounds the damage. On most holes there isn’t much risk of a catastrophic miss (water or OOB) and the value of the extra distance with driver easily makes up for the slightly larger chance of ending up in the rough or a fairway bunker. However, on certain holes the safe zone (width between water/OOB/trees on one side and water/OOB/trees on the other side is more narrow, increasing the likelihood of a catastrophic miss. On other holes the fairway narrows dramatically in driver range and it becomes much more likely that a player will hit into the rough or a fairway bunker with driver – negating the extra distance. In both cases players regularly hit 3 wood, 5 wood, hybrids, or long irons off the tee. To properly evaluate club selection strategy you have to know how golfers performed in general on each hole depending on whether they chose driver or a lay-up. However, no one tracks club selection and even collecting that data from broadcasts is an impossible task (were one even inclined to manually charting) because broadcasters show par 4/5 tee-shots less than any other type of shot. To address this I developed a model that estimates the probability that a player hit driver, 3 wood, or a shorter club based on 1) the distance of the shot (300+ yards almost always means driver; <250 yards means a lay-up), 2) location of the shot after tee-shot (the fairway adds a few yards, rough/bunkers subtract a few yards), 3) angle off-line the shot is hit (larger misses travel shorter than shots down the middle), 4) golf course conditions (general altitude of the course, specific elevation of the hole, firmness of fairways, atmospheric considerations, etc. ), and 5) player driving distance ability (represented by their driving distance stats). 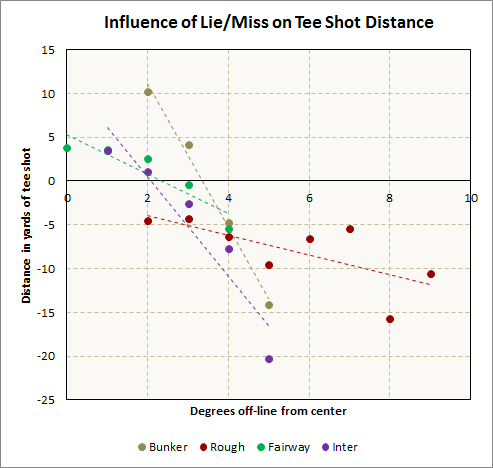 The graph below shows a general model to adjust distance based on lie. This is important because tee-shots that are flown into fairway bunkers/rough generally roll shorter distances than tee-shots that might roll along the fairway before settling into the rough or a fairway bunker. In general, the roll portion of a tee-shot represents about 20-25 yards of distance. This evaluates the distance gained/lost relative to others on that hole based on the lie (rough/intermediate/bunker/fairway) and the degrees off-line from the center of the fairway. The graph is specific to the 1st Round at the Frys. Silverado CC is located near sea level which eliminates any impact due to altitude. Certain holes are slightly uphill or downhill, so I’ve adjusted those holes to add or subtract distance. The impact is largest on the 3rd hole (uphill tee-shot subtracts roughly 6 yards of distance) and the 9th hole (downhill tee-shot adds roughly 10 yards of distance). The course conditions varied throughout the week. I estimate the first three rounds were played in conditions slightly drier than average (adding roughly 1-2 yards per tee-shot) while the conditions in the final round were much drier (adding roughly 5 yards per tee-shot). The most important factor is how far each player can hit driver. That’s estimated fairly well for regular Tour players through their measured driving distance. I used that for both returning PGA Tour and for returning Web.com players (with an adjustment to correct for longer courses played). For the few players without that data I used PGA Tour average driving distance of 289 yards. I estimated that each player hits 3 wood approximately 30 yards shorter than driver – which is consistent with player estimates and Trackman data. Obviously not all players carry a 3 wood, but it works as a general approximation. The chart below summarizes the basic results. Players hit driver between 63% and 71% of the holes and regularly chose something shorter than driver on five holes. This is slightly less than PGA Tour average where driver is hit around 70% of holes. I evaluate the decision to hit driver or a shorter club based on the position after the approach shot. This method considers the distance from the pin and lie after the 2nd shot on a par 4 and par 5 in terms of average strokes remaining to hole out from that position. Players roughly split for the week between driver and a shorter club. Many were wary of the fairway bunker down the right side between 270-300 yards, choosing to hit 3 wood instead. The fairway also narrows from around 38 yards to around 28 yards after 270 yards. The advantage to hitting driver was consistently around 0.1 strokes better performance in all four rounds. Few players hit driver on this hole, maxing out at 25% in Round 4. This is a short par 4 where the fairway narrows considerably at driver length. Overall, those hitting driver here played about 0.06 strokes better across all four rounds, though all of that over-performance relative to shorter clubs was in the 2nd round. I’m still unsure to what level driver vs. shorter club performance is repeatable between rounds. Around 40% of players hit driver on this hole, consistent throughout all four rounds. There are two fairway bunkers here – one ending at 250 yards and one beginning around 280 yards. The fairway narrows from 38 yards to 28 yards at the second bunker, and to the right is out of bounds. 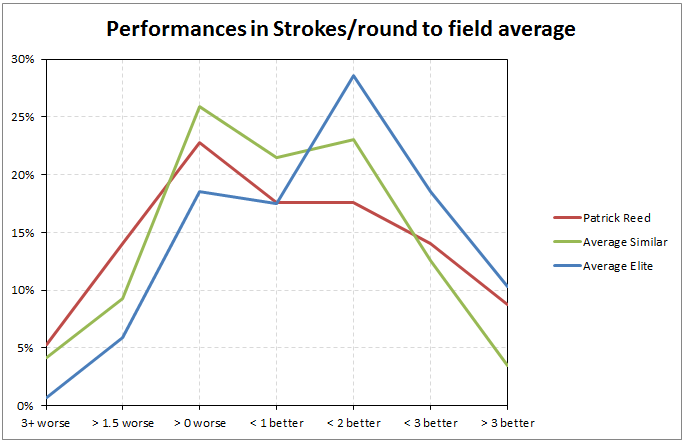 Players hitting driver were slightly advantaged by 0.08 strokes throughout all four rounds. Around 40% of players hit driver here, also consistent throughout all four rounds. The concern here is a fairway bunker right at around 265-290 yards off the tee. Players who hit driver were slightly advantaged here to the tune of 0.06 strokes over four rounds. This hole played as a drivable (~300 yard) hole in Round 3. 33% of players hit driver over the four rounds – 42% in the 3rd Round. The landing area for a driver is dominated by a fairway bunker left. A bad miss left ends up in the bunker or trees, while a bad miss right could end up behind a tree. The pin positions in the 1st & 2nd Rounds also required an accurate approach to miss the pot bunker just short of the green.The 3rd Round was the only round where there was an advantage to using driver (0.17 strokes), which makes sense because the benefit of hitting the green off the tee on a par 4 is an almost assured birdie. The other rounds showed an advantage to laying-up with 3 wood or shorter. I haven’t evaluated the player by player results against reality, so these are absolutely estimates. In general, shorter players hit driver more often. This is because 1) they need to hit driver to keep up with the field, 2) because when they hit driver they can avoid many of the bunkers/narrowed fairways that are set-up to capture longer shots, and 3) because their bad side-to-side misses will travel shorter and into less dangerous positions. You can see this based on the difference between a player’s measured driving distance and driving distance on all shots. Shorter players have less of a gap, indicating fewer non-driver shots. Jerry Kelly, Tim Clark, and Jon Curran (all very short off the tee) were the three leaders in % of drivers hit at above 85%. Matt Kuchar (slightly shorter than average) also was aggressive off the tee hitting driver an estimated 84% of the time. This fits prior data; Kuchar is normally quite aggressive off the tee, which compensates for his shorter overall driving ability. Last year, Brooks Koepka had one of the largest gaps between measured and actual driving distance (17 yards), indicating he laid-up off often off the tee despite being one of the longest hitters on Tour. He was extremely aggressive this week – 9th in % drivers hit at 79%. The winner, Sang-Moon Bae, finished 14th in % of drivers hit at 75%. Tyrone van Aswegen finished last in % of drivers hit with only 44%. Of notable players, Marc Leishman, Graham DeLaet, Jimmy Walker, and Hideki Matsuyama were all in the bottom 15 of players that made the cut (less than 55% drivers). DeLaet opted against driver more often than most last year. Jason Kokrak was the most likely of the very long hitters last season to lay-up (56% approximately) and he hit driver only 56% of the time this week. This three week break between seasons doesn’t provide for a lot of time to digest the 2013-14 PGA Tour season and preview the 2014-15 season. I’m still digging through the data from last year, trying to highlight which players took genuine steps forward, who’s stats are throwing up red flags, etc. However, these are my top twenty golfers for next season. The criteria is a bit murky, but it’s basically the twenty guys who will make the largest on-course impact on Tour – whether it’s cashing checks, winning tournaments, or even winning majors. Most of these guys are obvious (it’s no secret that Rory is a beast), but maybe a few won’t be so intuitive. Luke Donald’s fall from grace this season was unexpected, but he both regressed sharply in his long game (tee shots/approach shots), but also slumped with the putter over the last half of the season. Guys who fall off sharply in their long games tend not to rebound much the next year. Kevin Na finally had his break-out season and no one seemed to notice. After an injury riddled 2013, Na came back with the 17th best season on Tour – all because of a huge improvement off the tee and with his irons. Billy Horschel’s end of the season FedEx run was awesome. He was my last cut from the list, mostly because I want to see how he deals with being the guy with the target on his back this year. Chris Kirk had a bit of a break-out season as well, winning the McGladrey early and the Deutsche Bank late. It looks like a lot of his success was more of a putting surge than anything. My numbers still love Steve Stricker, but he’s going to be 48 and his long game cratered this year. He’ll still pop up a few times this year, but his run at the top is done. 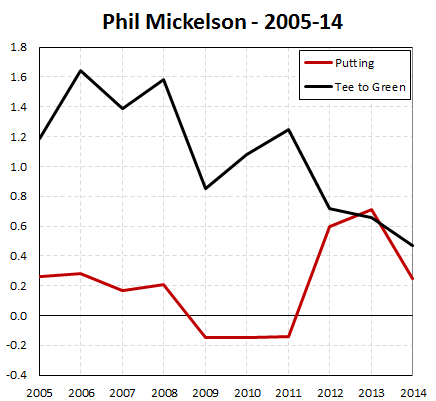 I could write a whole post on why I think Phil Mickelson is done as an elite player, but the below chart sums it up pretty well. His tee to green game has been in terminal decline for years, covered up by miraculous putting in 2012-13. He’s just so reliant on his short game/putting these days that it’s hard to see him contending that often. Matsuyama’s first full season on Tour was an obvious success. After a mixed bag in the opening few months (a pair of top tens to go with three injury W/Ds), Matsuyama broke through with his first victory in a playoff at the Memorial. At only 22, he’s already proven himself as one of the ten best ball-strikers on Tour – particularly on the short/medium approach shots. His putting was disappointing – 156th in SG Putting and pretty terrible on the short putts that really show off a golfer’s true talent – but that’s his only weakness. Perhaps most importantly his two year exemption from winning the Memorial means he’ll be able to compete this season without any pressure to retain his card. 2013-14 was his true break-out, winning three times and earning a spot on the Ryder Cup team where he was one of the only Americans to impress. Walker’s early season run was built on wildly unsustainable putting success, and he regressed sharply to his career averages as the season went on. However his tee to green game got even better after his third win; even though he putted worse than PGA Tour average down the stretch, he still earned two top tens and finished T26 or better in six of seven events. He’s the prototype of a long, but wild hitter off the tee. His emergence the past two seasons has been down to his vastly improved iron play. It’s really unlikely he has anything like the success on 2013-14, but another trip to the Tour Championship and a Presidents Cup spot wouldn’t be surprising at all. Zach Johnson really fell off the radar this year. His only win came at Kapalua in January when no one is paying attention, then suddenly he was playing in the Ryder Cup. The culprit for Zach this year was just not making putts. He’s been one of the best putters on Tour for years, but slumped this year. I have no doubt he’ll putt better this season and if he does I expect we’ll hear from him a bit more often because his tee to green game was as sharp as ever last year. G-Mac benefited the most last season from a lucky and/or much improved putter. His career SG Putting was around average entering the season, but he finished #1 on Tour in SG Putting by the end of the season. Everything I’ve ever researched regarding changes in putting performance suggest he’s going to regress sharply next season. However, McDowell was already consistently excellent at long putts, and his improvement was almost entirely in putts inside 15 feet – the kind of putts where talent shows more strongly over a season. Long story short, G-Mac’s putting improved a lot, but I think he has a good shot at retaining a lot of that improvement and really establishing himself as an above-average putter. I think there was a lot of sense this year that Keegan Bradley wasn’t living up to expectations. He was consistently strong all season, but never really contended in a major event and missed the cut at the Masters, PGA, and Players. All in all though, he was a solid top 20 player on Tour – he just missed out on the wins. I expect he’ll find a win this year and earn his way into the Tour Championship without much problem. Schwartzel was another guy that just wasn’t on the Tour’s radar at all this year. He delivered the kind of elite tee to green performances that it takes to win at the Memorial and WGC-Bridgestone, but the putter let him down both weeks. He’s always really strong tee to green, especially with his irons. Predicting a win is always tough – especially for guys like Schwartzel who always play strong fields – but no one should be surprised if Schwartzel wins this year. After last summer/fall’s run where Stenson won both the PGA Tour’s FedEx Cup and the European Tour’s Race to Dubai, he still managed to record one of the best seasons on Tour, though without a win this year. Stenson’s game is built around long, accurate driving – he’s one of the top five on Tour off the tee – and is great with his irons as well. His length and accuracy also give him the green light to attack most par 5 greens in two, making him one of the more aggressive players on Tour. His only flaw is his putting; it likely cost him a win at Bay Hill this year. There were few guys in the world getting better results over the first half of the season than Spieth. By the time he finished 2nd at the Players, he had six top tens in fourteen starts and had contended down the stretch at two huge tournaments. He didn’t play awful in the second half, but he struggled off the tee and his approach shots weren’t that great. Struggles in those long game components tend to stick around for awhile, so priority #1 for Spieth has to be getting his tee to green game squared away. His short game and putting were really solid again this year, so no problems on that front. I’m going to regret ranking him here if he gets his long game squared away because he was a legit top five in the world player early in 2014. Now we get to the biggest question mark of the season, how will Tiger return? I think there’s some sense that Tiger wasn’t a stud in 2012-13 because he didn’t win a major (we forget he had three top tens in eight tries in majors). Based off that and how terrible he was when injured this year, people are expecting the worst for Tiger next year. I’ve even weighed him from an analytics perspective and highlighted how aging is going to prove his highest hurdle in the coming years. Let there be no question that Tiger has shown the ability since 2009 to be the best golfer in the world. Between 2012-13, after he got healthy and adopted his new swing under Foley, he was the best golfer in the world. He won eight times on Tour – including against strong fields at the Players and WGC events – and posted the best scoring average relative to the field over those two seasons. The question is whether he can get healthy again. He’s missed significant time due to these nagging injuries twice now in the last four seasons. If he can get as healthy as he was in 2012-13, I expect him to play to the level of no worse than 2nd best in the world. That means 2-3 wins and contending consistently. I think it’s unlikely he ever returns best in the world, simply because Rory has been essentially equal to him the last few years and aging from the late 30s on saps a lot of golfers’s performance. And he’s not going to equal or best Jack’s record unless he has a lengthy run of healthy seasons. Bubba was nuclear hot early in the season – 2nd in Phoenix, win at Riviera, 2nd at Doral, and win at Augusta. Later on, he was an errant drive away from likely winning the Memorial and his tee to green game was dominant enough to win at the BMW Championship, but he couldn’t make a putt all weekend. I still think there’s some sense around the Tour that Bubba’s driving makes him a one trick pony. That might have been fair in 2010, but he’s improved his short game and putting so that they’re not dragging him down, and his irons are good enough. He’s also much less wild than normally perceived – he was about average in hitting fairways this year and cut his number of Other drives (tee shots that land out of bounds, in the water, or in the trees) down to nearly Tour average this year. His ability to out-hit the field will always make him deadly on Augusta’s comically wide fairways, but he performed great at the Memorial this year and that course probably has the toughest rough of the normal Tour season. Suspension or “leave of absence” aside, Dustin Johnson was having his best season as a pro in 2014. He beat a great field in China to start the season before some near misses to Jimmy Walker (Pebble Beach), Bubba (at Riviera), and Patrick Reed (Doral). He only missed three cuts all year and had high finishes at both the US Open and Open Championship. Assuming he comes back healthy and focused from this sabbatical, there’s no reason why he can’t continue to play at a top ten level. His hypothetical six month suspension expires just before the Tour heads to Pebble Beach – the course he’s had both his most professional success and worst professional moment. I’ve written fondly about Haas’s game quite a bit the last few months. His performance this year was nearly flawless, with only a W/D at the Heritage to mar 27 made cuts in 28 starts. Haas isn’t just making cuts either; he had five top tens and seventeen top 25s. Inexplicably left off the Ryder Cup team, Haas figures to be a sure bet to make the 2015 Presidents Cup squad with another similar season. Despite winning five times in the last five years and taking home the FedEx Cup, there are still people sleeping on Haas as an elite player. He earned just over $2.8 million last year and I’d peg him as extremely likely to eclipse that total if he stays healthy this year. After the start to the season Rickie Fowler had – five missed cuts by March and only a 3rd at Match Play – people were obviously way down on him. He and Butch Harmon had changed his swing and his game was a mess, especially the putting. Starting with the US Open though, his swing clicked and he started to hole nearly every putt, and only Rory and Furyk were better from June to September. He’ll be lucky to ever putt that well over a few months, but his tee to green game really improved over previous seasons. He’s at a level right now where he’ll be a stud even when the putting regresses to normal. I’ve written at least half a dozen posts about aging this year, and with each one I marvel a little more at what Jim Furyk has been able to accomplish. Ignore that he hasn’t won in four seasons; this guy is as good now as he was ten years ago and just had his best season since his mid thirties. He continues to churn out top ten tee to green seasons. His game is just perfectly calibrated to hit fairways, hit greens, and scramble in the rare case he misses one. He had four seconds this year! At 45! I think he’ll fall off a bit this year, but he’s still going to be a huge factor every week. Kuchar’s season can be summed up in two hole-outs. First, he lost in Houston when Matt Jones holed out to win their sudden death playoff. Kuchar then holed out to win the Heritage two weeks later. Kuchar never seriously contended for the rest of the season (though he added four more top tens – 11 for the season). Only Jason Day has a better all-around game; Kuchar’s solid off the tee, hits his irons well, and his short game is good. He really shines with the putter, where he’s around the top ten on Tour consistently. In terms of week-to-week earnings, Kuchar’s as solid as anyone on this list but McIlroy because of how many starts he makes. One of these days he’s going to run into a major win or FedEx Cup. Given the thumb injury Day was suffering through for almost the entire PGA Tour season, it’s remarkable he was able to have so much success. Day ended up top twenty on Tour tee to green, despite that injured digit, and turned in another great putting season. Fully healthy, there’s no doubt Day is going to improve off the tee and with his irons, and his short game is already ridiculously good. Add in that he’s a legitimately great putter and there’s not much doubt that Day’s going to be a stud in 2015. He’s consistently been a monster in majors, so it’s a question of when, not if, he’s going to win one. Sergio went winless on Tour this year, an amazing fact since he played two of the ten best tournaments of the season relative to the field. Unfortunately, Rory McIlroy beat him both times (Open Championship and WGC-Bridgestone). This was a textbook Sergio season; he was one of the best in the world with his irons and continued his recent success with the putter. If there’s ever a season where he’ll win a major, 2015 looks like the ideal one. Sergio has always been strong at the links set-ups, and this year the majors visit three links style courses. Sergio is as good a pick as any to win one of them. There’s really not much to say about Rose. He’s simply one of the best ball-strikers in the world and has emerged the past few seasons as one of the best players in the world. This year might’ve seemed like a bit of a disappointment after the US Open win in 2013, but he won twice (at Congressional and the Scottish Open) and dominated at the Ryder Cup. Like the guys right above and below him on this list, he’s right in the middle of his prime and playing great. He’s a threat to win any time he can string together four above-average rounds with the putter. In the rush to anoint Rory as The Best in The World (and he is), everyone missed the season Adam Scott put together. He only won once (Colonial), but his worst finish this year was T38 at the Players and he didn’t fall below T16 after that. Early in the year he rode a hot putter, but when that cooled down down the stretch he was still stockpiling top tens. He has a top five long game in the world, and has shown the past few years that he can be just average with the putter. This year he’ll likely start experimenting with some modified putting technique because his method of anchoring will be illegal in 2016, but I doubt he’ll face any long term trouble from that. More importantly, he’s coming off a dominant three year stretch where only Rory and Tiger have hit higher heights and he’s smack in the middle of his prime. Another major title and multiple wins should be the goal this year. Rory had a season for the record books. The best season by my ratings since Tiger Woods in 2009, the best driving season in the Shot Link era, two major wins, and two more victories in huge events. Most importantly, he absolutely killed the narrative that he can’t hold onto a lead – he responded to blowing great first rounds at the Memorial and Scottish Open by pulling away from the field in the 2nd round at the Open Championship. His combo of distance and accuracy is ridiculous; he not only can outhit the field by 20+ yards every time, but during his run in July-September he almost never lost a drive out of bounds or in the water. Typically the long hitters are restrained by that inaccuracy, but Rory knows he’s going to be able to keep those 310 yard bombs in play. The rest of his game was great this year. When you’re gaining over a stroke on the field just off the tee, you can afford an average short game. His irons were top ten on Tour, which is just unfair. And I’ve written about his putting. It’s impossible to putt as well as he did in July-August long-term. What he did in the FedEx Playoffs when he was essentially Tour average is much more indicative of his long-term putting abilities. That’s fine, but it’s what separates him from ~2000 or 2005-08 Tiger Woods. That version of Tiger was the best in the world tee to green, but also was one of the best putters in the world. Rory still has time to work on his putting and get to that level, but all of his putting improvement this year was on long putts. Performance on long putts is extremely noisy even over multi-year samples. Despite all that, Rory enters every tournament as the favorite from now on.